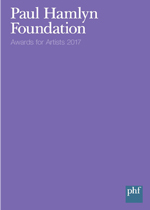 Paul Hamlyn Foundation is delighted to announce the recipients of Awards for Artists 2017, following a reception at our offices in London on 9 November. Left to right: Steven Claydon, Linder (sitting), Leafcutter John, Serafina Steer, Byron Wallen, Laurence Crane (sitting), Rehana Zaman, Peter Kennard, Charlotte Prodger (sitting) and Mary Hampton. Photo Credit: Emile Holba. Over 200 guests from across the arts sector and beyond joined us alongside guest speaker Jarvis Cocker for the announcement of this year’s recipients. Chief Executive, Moira Sinclair, welcomed attendees and revealed that the number of awards for composers has risen from three to five, bringing them in line with those for visual artists. The amount awarded to each artist in both art forms has also increased from £50,000 to £60,000 to recognise cost of living increases. The awards provide visual artists and composers with significant support with no strings attached at a timely moment in their careers. As the largest awards made to individual visual artists and composers in the UK, they are designed to give recipients the time and freedom to develop their creative ideas. In his personal and witty keynote speech, musician and writer Jarvis Cocker reflected on Paul Hamlyn’s work to bring high quality books, music and art into people’s homes. He told a story of how this resonated with his view of the importance of creativity in people’s lives, and how poverty cannot be reduced to economics alone. To thrive, inspiration and imagination are key. The Foundation would like to take this opportunity to congratulate all the recipients and to thank everyone who made the awards possible, including the judges and nominators. We would also like to extend our thanks to Jarvis Cocker for his warmly received contribution. Full biographies and examples of each artist’s work can be found on here.